CNG: The Coin Shop. BRUTTIUM, Kroton. Circa 530-500 BC. AR Nomos (28mm, 7.11 g, 12h). Spread incuse type. BRUTTIUM, Kroton. Circa 530-500 BC. AR Nomos (28mm, 7.11 g, 12h). Spread incuse type. 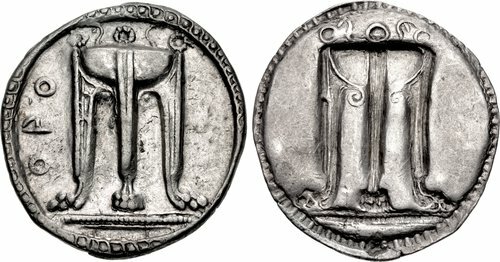 Tripod, legs surmounted by wreaths and terminating in lion's feet, two serpents rising from the bowl, set on basis of three lines, the center dotted; (koppa)PO to left / Incuse tripod as obverse, but wreaths and serpents in relief. Gorini 4; Attianese 1; HN Italy 2075. Good VF, underlying luster, a few minor striking splits. Well struck.